Happy 2013 and welcome to my first post of the year. 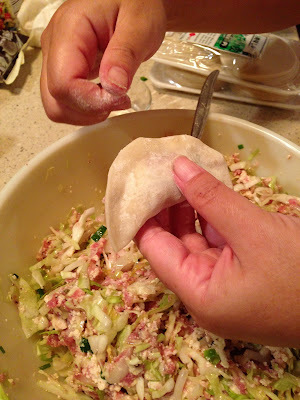 New Year's Eve in Hawaii is about friends, family, and food - a common theme of this blog. There are some who go to the fancy dress parties drinking champagne and dancing at midnight but most folks are gathered together eating lots of good, home-cooked food. The different cultures represented in Hawaii mean that you'll find anything from sushi and sashimi to lumpia to crispy gau gee to smoked turkey on the table. Everyone brings something and there's always too much. 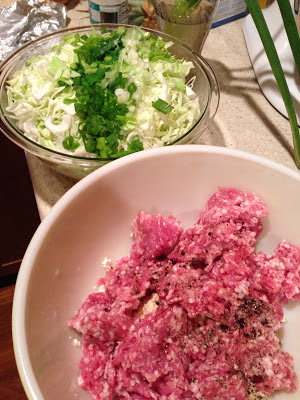 One of our good friends is half Korean and her family's tradition was to make Korean dishes like meat jun and mundoo on New Year's Eve. From her family, my sister and I learned how to make mundoo and have adopted it as one of our traditions. Many cultures have some form of a dumpling and each family has their own special recipe. This is our interpretation of our friend's recipe. As with many family recipes, the amounts are approximate and can be adjusted according to taste. 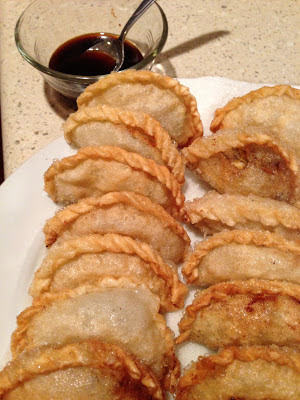 I don't make mundoo without my sister because she does such a beautiful job forming the dumplings (as you'll see below). When I make an attempt it looks "rustic" for lack of a better description. 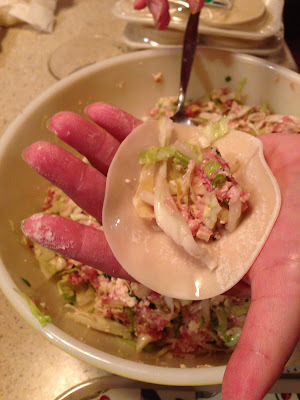 I function much better in the role of sous chef - prepping the filling ingredients and taking it to the half-moon stage and then cooking the mundoo after they're folded. But don't be intimidated, they taste good in whatever form they take. For the filling: Place the cabbage, bean sprouts, and green onions in a microwave-safe bowl. Add a little water and steam the vegetables for a couple of minutes. You want to soften the vegetables, not cook them. Set aside and cool. Drain the tofu well and crumble into a large bowl. Add the remaining ingredients including the cooled vegetables (leaving out any of the excess water that may be left in the steaming bowl). 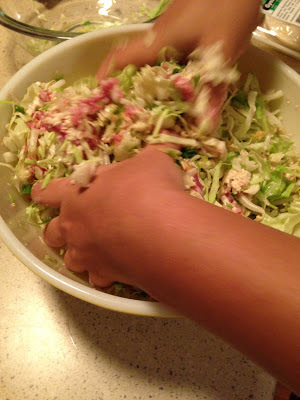 Mix (by hand is best) to combine - don't over mix. 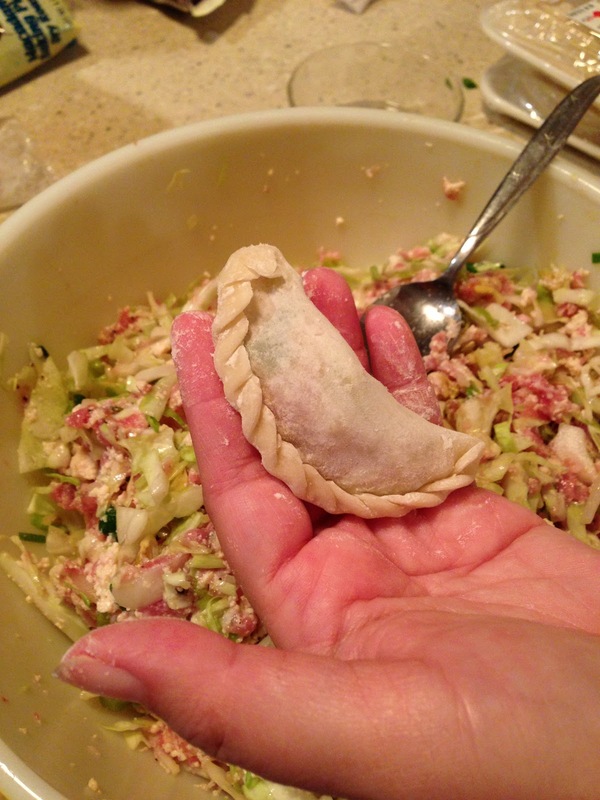 To form the dumplings: Place a teaspoon of filling in the center of the mundoo wrapper. 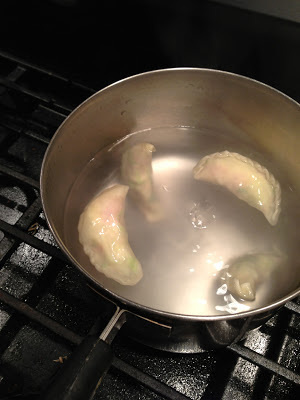 Fold the dumpling into a half moon, pressing out excess air and sealing the edges with a little water. 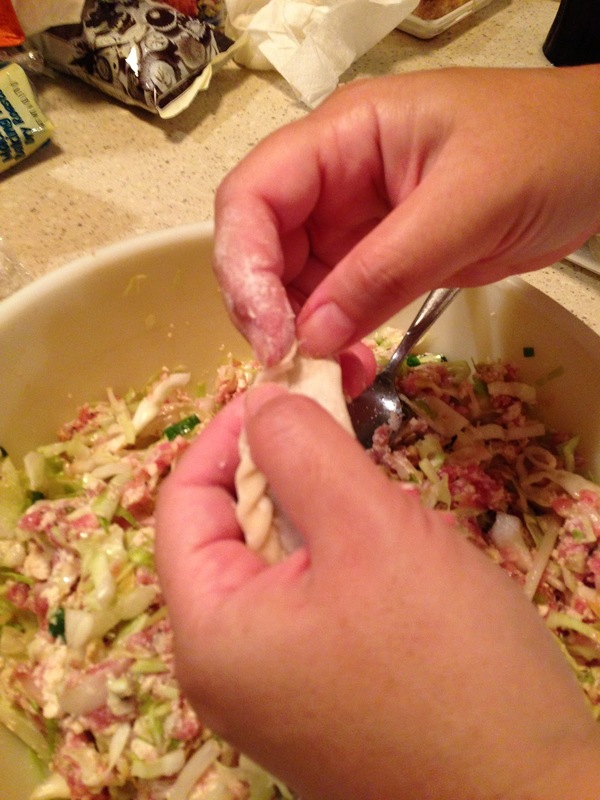 Fold over small "corners" of the edge over on itself to form a "braided" edge, pressing the last piece in place between your thumb and forefinger. Boil the mundoo for about 2 minutes - the wrapper will look a little transparent. Drain on a rack to remove excess water. Fry in oil (about 350 - 400 degrees) to a golden brown. Serve with dipping sauce. Note: mundoo may be frozen once wrapped, before boiling. 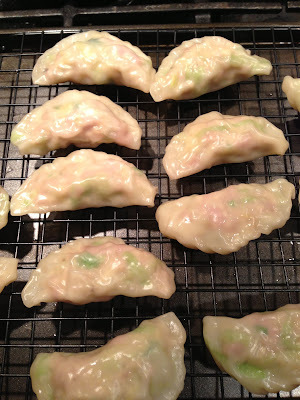 Place on a parchment covered tray and freeze until solid. Store in a Ziplock freezer bag until ready to use. Those look yummy. Kent and I may have to try them!